To effectively spray epoxy and obtain a desirable finish, it must be atomized. As epoxy leaves the spray gun nozzle, it is reduced to tiny droplets (spray mist). Most of the spray mist that doesn’t land on the surface that is being sprayed will remain airborne for some time before settling to the ground. While the mist is suspended in the air, it is likely to be inhaled, causing respiratory tract irritation or burns, sensitization, chemical pneumonia and other serious health complications. Spray mist settling on unprotected skin or eyes can result in eye injury, skin sensitization and allergic reactions. Spraying increases the amount of hazardous volatile components released from the epoxy, compared to other application methods. In addition, using solvents to thin the epoxy so it can be sprayed poses equally dangerous health and safety risks. 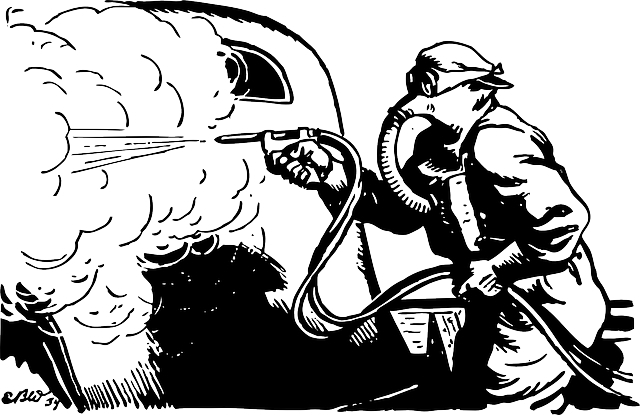 Solvent-related hazards would be similar to those of any spray painting operation, and involve both health and explosion concerns. If you are determined to spray epoxy, hazard control steps are crucial. Control of hazardous vapor or spray mist is best achieved with isolation and enclosure, such as a properly designed, ventilated and filtered spray booth. In any case, if you are spraying epoxy, use of an air-supplied respirator and full-body protective equipment is absolutely a must.